This nationwide parts distributor was experiencing multiple mobile device failures — every day. And with more than 150 locations across the U.S. and Canada, the downtime was adding up. We were able to get them back up to speed, reducing their helpdesk calls by 90%. Read more. 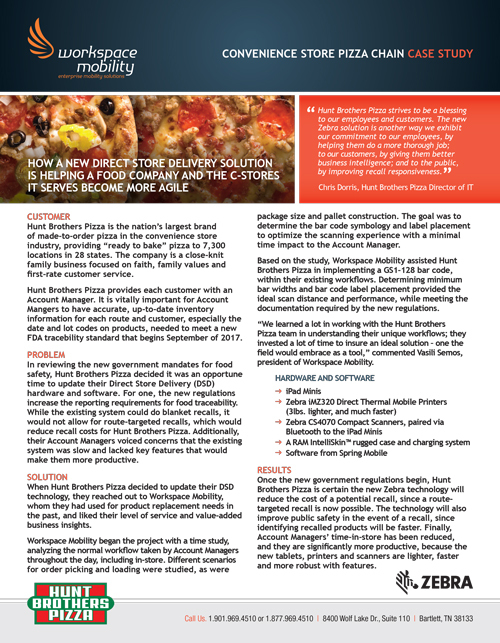 This company supplies ready-to-bake pizzas to 7,300 c-stores in 28 states. Their large footprint makes food recalls challenging. And with new FDA traceability regulations coming, they needed to be prepared. We updated their devices so they could perform route-targeted recalls. They saved money, increased productivity, and stayed compliant. Read more. Organizers of this PGA tournament needed a better solution to track spectators and sponsors. We helped them upgrade from handheld clickers and wristbands to mobile computers that we monitored and managed remotely. The end result? Detailed data to save them time, money, and headaches. Read more.